Okay, two questions. First: can we get a translation of the text for us non-japanese speaking types? Second: any bets on what is in the little girls room? Left panel: "Stand in front of the urinal and don't spill any to the sides"
"Make sure to stand close"
"This is too far away. Stand a step closer". 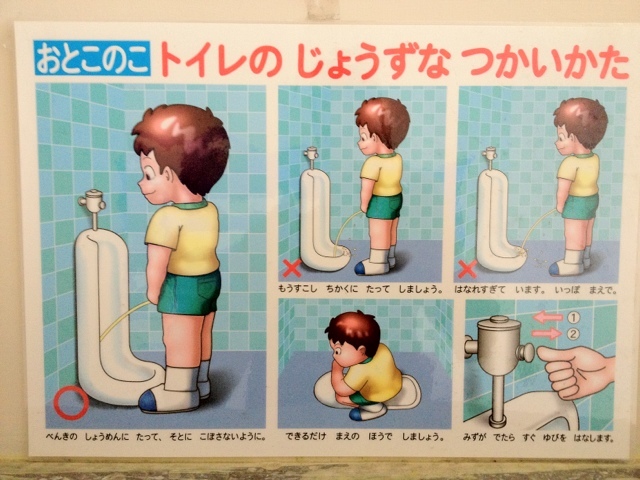 "[When using Japanese-style squat toilets] get as far forward as possible". "Release the flush button as soon as water begins flowing".